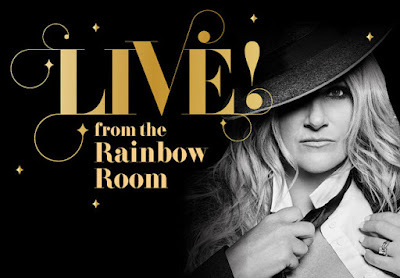 On Thursday, February 14th, platinum-selling, multiple Grammy, CMA and ACM award winning artist, Trisha Yearwood, will serenade guests with an intimate performance inside one of New York's most glamorous and iconic settings. Set 65 stories above the landmark Rockefeller Center with panoramic views in every direction, Trisha will host a one-night only performance on the most romantic night of the year. The performance will feature songs from her "Let's Be Frank" album, a collection of songs made famous by the legendary Frank Sinatra, who frequented Rainbow Room as both a performer and patron. The New York Times Bestselling cookbook author and chef will also work with Rainbow Room Executive Chef Mathew Woolf to curate a special four-course tasting menu with wine pairings. Since opening in 1934, Rainbow Room has been famous for hosting legendary performers. The LIVE! from the Rainbow Room series is a way for the Rainbow Room to offer guests the rare opportunity to experience one of today's greatest artists in a stunningly intimate setting. Possessing one of the most powerful female voices in Country music, Trisha Yearwood has charmed audiences with her warmth, wit and honesty starting with her very first single in 1991 which debuted at #1 on the Billboard Country Singles Chart. Her latest album "Let's Be Frank" is available now for a limited time in Williams Sonoma stores nationwide and on williams-sonoma.com until its release everywhere on February 15, 2019. Upon arrival, guests will be welcomed with a glass of champagne. The four-course tasting menu with sommelier wine pairings curated by Trisha Yearwood and Executive Chef Mathew Woolf will be served, followed by the performance. Tickets will be $325++ per person. Tickets are available at rainbowroom.com/live-rainbow-room/. The dress code is cocktail attire and jackets required for gentlemen. Quintessential New York glamour finds its home 65 stories above the landmark Rockefeller Center. Crowning the timeless Manhattan skyline, the iconic Rainbow Room offers a modern twist on classic old-world charm, tailoring special moments for private events, and unforgettable evenings of live entertainment. Since its debut in 1934, the Rainbow Room has drawn the world's elite to its curated, elevated and glamorous luxury. Rainbow Room's name was inspired by the installation of a color organ that automatically converted music into changing colors in harmony with the moods expressed by the music. In 2012, the New York Landmarks Preservation Commission declared Rainbow Room a New York City Landmark. Following three decades in the spotlight, numerous GRAMMY®, CMA®, and ACM® Awards to her name, countless multiplatinum certifications, and millions of fans entertained, the same passion still motivates and moves Trisha Yearwood. The singer, actress, author, chef, personality, and entrepreneur derives deep fulfillment from simply walking up to a microphone and pouring her heart out by way of a celebrated powerhouse voice. In 2019, she continues that tradition with her first solo full-length since 2007, a collection of Frank Sinatra covers and one original entitled Let's Be Frank. At the same time, she remains a timeless entertainer whose influence permeates multiple facets of culture. Beyond twelve studio albums, she hosts the EMMY® Award-winning Food Network hit Trisha's Southern Kitchen and her Facebook Live "pre-show," T's Coffee Talk. At the forefront of a veritable lifestyle empire, she penned three New York Times-bestselling cookbooks and has designed cookware, furniture, home accessories, and area rugs. Trisha has also collaborated with Williams Sonoma on her signature best-selling cocktail mixes like "Summer in a Cup," "Autumn in a Cup," and "Christmas in a Cup" as well as a variety of food products ranging from a signature biscuit mix to a complete Thanksgiving Dinner.